Exclusive amber jewellery from Poland. Amber jewelry. Arkada Art - the producer of exclusive silver and amber jewelry invite you to visit this web site. The best quality amber jewellery from Poland. Silver and amber jewellery. Modern amber jewellery. Natural Baltic amber jewellery. Amber - religion and medicine. The history of amber is very rich. It was a valued raw material in the Early Stone Age. People used amber for the production of jewellery and ornamental goods for many centuries in all the major cultures of Europe, the Middle East, Asia and the Far East. The ancient Greeks and Romans both believed in the magic powers of amber. People thought that its electrostatic energy also had the power to draw all manner of misfortune away from them. Tiny pieces of amber have been discovered inserted beneath the skin covering the hands of Egyptian mummies. The Egyptians believed that amber secured the mummy against destruction and decay. We can find also amber amulets in ancient graves, where they were placed in order to protect the dead in the afterlife. To this day, Zuni Indians produce a variety of amber amulets, occasionally combining them with other semiprecious stones. The belief in the power of these talismans to safeguard and protect is one which is not only popular among Indian tribes, but is also gaining favour in other societies, e.g. Germany and Japan. Knowing that amber as a stone has different properties, people soon discoverd that this stone held certain medicinal properties. The earliest accounts of amber's medicinal properties are found in the works of Hippocrates (460-377 BC), who is known as the father of medicine and Pliny the Elder. Callistratus states that a short string of amber beads worm around the neck brought relief to the wearer in some cases of severe head, neck and throat complaints. Wearing amber bracelets was thought to be beneficial to sufferers of rheumatism and arthritis and reduced fatigue and feelings of general weariness. A similar effect was said to be achieved by rubbing the body with a fairly large piece of the mineral. Various other creams, balms and infusions of amber steeped in alcohol were also recommended for external use. All manner of concoctions, of which amber was the main ingredient, were also widely used to remedy respiratory complaints, bronchitis, asthma, heart problems and ailments of the circulatory system, bowel and bladder disorders. In nineteenth-century literature we find evidence of amber having been used as a remedy for virtually all illnesses. In today's era of "healthy lifestyles", when everything that is "closer to Nature" is in vogue, using every available natural product has become very popular. Thus, it is obvious that medicines whose main ingredient is amber are in such great demand at homeopathic chemists. The cosmetics industry uses this mineral in a wide range of creams, tonics and treatments which are easily absorbed into the skin's deeper layers. Most of the information used in texts comes from the book : "Amber - Treasure of the Ancient Seas." Arkada Art - exclusive silver and amber jewelry. The best quality amber jewellery from Poland. Silver and amber jewellery. Modern amber jewellery. Natural Baltic amber jewellery. 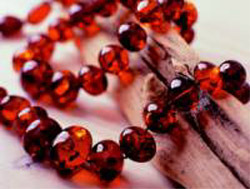 Wholesale amber jewelry.